Sam Snipes leaves legacy of wisdom - Times Publishing Newspapers, Inc. The shock of Sam Snipes’s passing on December 31st could be felt palpably in our community. At age 99, some had come to believe he would live forever! Ride a horse! 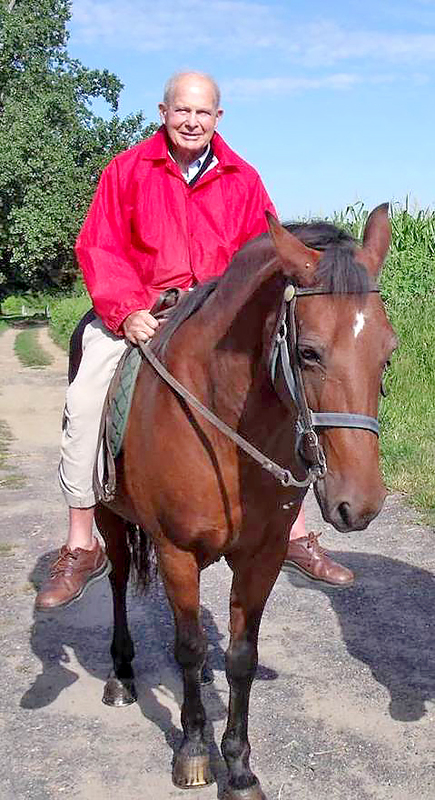 Seen for decades in community events, Sam’s lifelong passion for horses was no secret. Horses connect us to a time when life’s pace was slower and, likely to Sam, more noble. Each Sunday morning from the 1950’s through the 2010’s, Sam’s carriage could be seen filled with family and friends leaving Snipes Farm, “clip clop,” headed to the Quaker Meetinghouse in Fallsington. Know your history! Sam studied history and genealogy with fervor and enthusiasm. At Pennsbury Manor, Howell Living History Farm, Three Arches, Summerseat, and Bolton Mansion, Sam could feel the spirit of things built to last, appreciated the builders and those who lived there. He loved to dig for truth through research. He found inspiration in biographies and stepping into the whole of someone’s life and contributions. Keep moving! Sam did calisthenics with his children every morning, and was a runner, skier, tennis player, ice skater, square dancer and captain of his college football team. While visiting Howell Farm last spring he was given the chance to drive a team of horses at age 98, and took a horseback ride on his 99th birthday! Love each other! “He took an interest in me” has been repeated over and over as a gift Sam gave to many a person struggling to find their way. Sam’s commitment to social justice was based in the Quaker belief that the light of God exists in each person. When the first African-American family moved to Levittown in 1957, Sam provided legal help and even faced down an angry, racist mob. Sing together! Sam loved hymns, funny camp songs, college alma maters, and knew an impressive number of drinking tunes, even though he was a tee-totaler! He felt deeply that singing is a joyful way to feel kinship and unity anytime, any place with any one. Be a citizen of the world! As a relief worker in Europe, Sam helped refugees scattered by World War II and the Holocaust to return to their homes. He later invited people from around the world to visit Snipes Farm, believing that international friendships build peace through understanding. Grow food! Sam loved gardening and farming. One fall, while watching the Eagles on TV, Sam made 80 gallons of applesauce! An apple a day likely did keep the doctor away for nearly 100 years! Show up! Sam hardly missed a Sunday worship service with the Fallsington Quakers, or a board or committee meeting of the many local organizations to which he belonged. A few months before he died, Sam voted by absentee ballot. He believed we all have a duty to contribute to our community. Connect with nature! A visit with Sam included a tour of trees at Snipes Farm. He embraced every season, especially when snow was just right for a sleigh ride. The place he knew best and loved most was the farm of his birth where he daily regaled stories of those who came before him. His children, grandchildren and great grands and all those to come will carry on with devoted stewardship to make Snipes Farm a welcoming and inspiring place for all. Sam’s lessons for us are many. Guided by his example, may we all be excited by life and work together to build a peaceful and just world. And don’t forget to ride a horse! Editor’s note: A memorial service for Sam Snipes will be held at 2:00pm, Saturday, March 9th, at George School Meetinghouse, 1690 Newtown-Langhorne Road, Newtown. Memorial donations may be made to Friends Committee on National Legislation or to Snipes Farm and Education Center, a 501 (c)3 nonprofit organization (Farm Day Camp scholarship fund).